This excellent hand seeder was specially developed for careful, precise and fast positioning of single seeds. It is the ideal seeder for sowing in soil blocks, Jiffy pots, prepared beds and wherever an exact seed-distance is important. 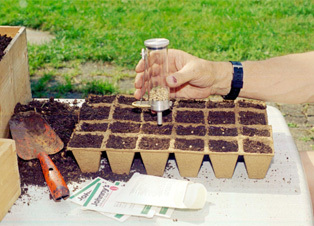 By individual seed sowing a lot of seed can be saved and thinning is no longer necessary. The push-pull slide releases single seeds when activated by the spring steel trigger.